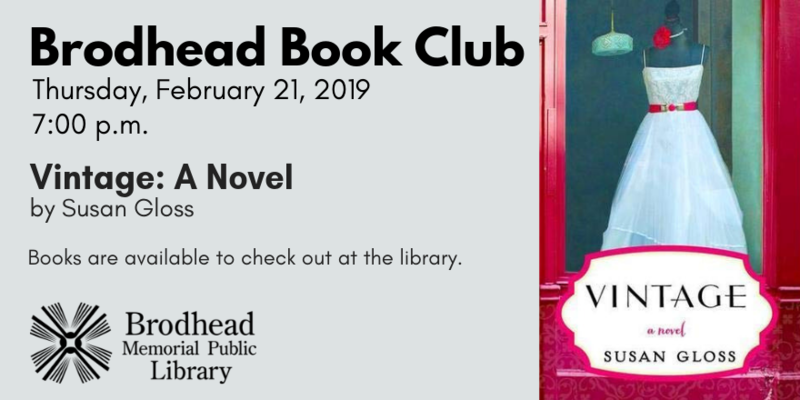 Join Brodhead Book Club at our February meeting, where we will discuss Vintage by Susan Gloss. Vintage is Susan Gloss's sparkling debut novel in the vein of The Friday Night Knitting Club, centered around a Midwestern vintage clothing shop and and a group of women who eventually transform the store and each others' lives. At Hourglass Vintage in Madison, Wisconsin, every item in the boutique has a story to tell . . . and so do the women who are drawn there. Violet Turner has always dreamed of owning a shop like Hourglass Vintage. When she is faced with the possibility of losing it, she realizes that, as much as she wants to, she cannot save it alone. Eighteen-year-old April Morgan is nearly five months along in an unplanned pregnancy when her hasty engagement is broken. When she returns the perfect 1950s wedding dress, she discovers unexpected possibilities and friends who won't let her give up on her dreams. Betrayed by her husband, Amithi Singh begins selling off her old clothes, remnants of her past life. After decades of housekeeping and parenting a daughter who rejects her traditional ways, she fears she has nothing more ahead for her.